All Four Love: Y3W: Almost Birthday Time! This week has been super busy as we prepare for C's first birthday party on Sunday! Lots of cleaning, decorating, and cake testing. So far we have his birthday banner and month pictures hung up as well as a few little things here and there. Luckily, my sister and brother-in-law will be coming up early to help us cook and finishing things up. The one thing I was super nervous about was making C's cake. I know what I want it to look like, but have only been dabbling in the cake decorating world for a few weeks now. Last night I decided to give it a shot and try to make his caterpillar cake topper. 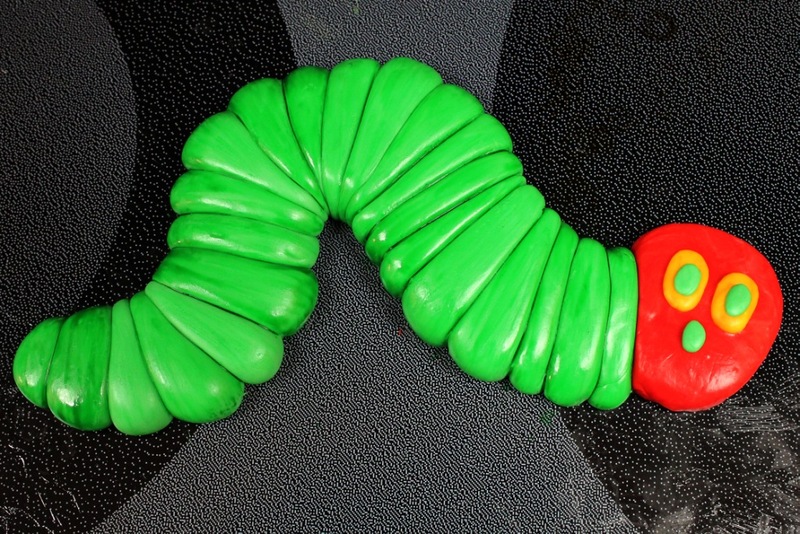 What a delicious looking caterpillar. Sha-bam. I'm not gonna lie, I am having one of those "even impressed myself" moments because I truly, honestly did not think I could make this. Its kind of hard to tell in the picture, but I used food coloring and water to "paint" on top of the solid green fondant. It gave it more of the watercolor Eric Carle feel than just the plain light green. And yes, the real thing will have antennae and feet. I ran out of red food dye and couldn't make the purple. ::puts food dye on shopping list:: Now the real magic trick is going to be to recreate this on Sunday on top of his actual cake. Send me some party karma. I'm gonna need it. Still left to do is some more cleaning, food shopping, cooking, and baking. All of his presents are wrapped, the RSVPs are in, goodie bags are made. This thing is really happening. My teeny tiny baby boy is turning one. Yikes! I am the curator of the C museum. Can you sum up your week in three words? Every Friday, Jenni from the Blog challenges bloggers to do just that every week. Fun, huh? Join in the fun! When you've written about your three words, hop around to other blogs participating in Y3W by clicking this lovely button! Thanks! I absolutely love the book too and, er...so does C. :-P Thanks for stopping by!